Published: Oct. 7, 2013 at 06:35 a.m.
(11:44) (Shotgun) D.Wilson right tackle for 5 yards, TOUCHDOWN. 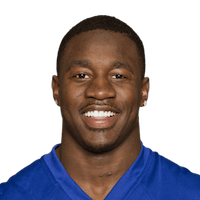 Published: Oct. 6, 2013 at 01:19 p.m.
New York Giants running back David Wilson runs into the end zone from 5 yards out and celebrates his first rushing touchdown of the season with two back flips. Published: Aug. 25, 2013 at 12:02 a.m.
New York Giants running back David Wilson takes off for an 84-yard touchdown run on the first play from scrimmage. Published: Aug. 18, 2013 at 07:24 p.m.
New York Giants running back David Wilson powers through the Indianapolis Colts' defense for a 21-yard gain.